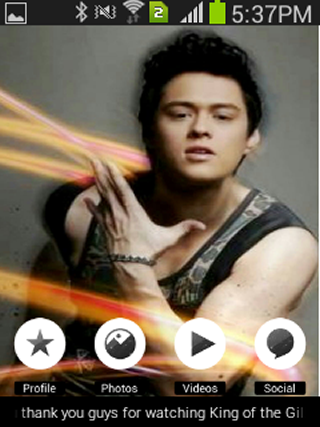 Dance like a pro with the Enrique Gil app!Thisapp features dance snippets and tips by the King of the Gilhimself,plus never-before-seen videos on the road! Get our FREE app today and gain instant access to hundreds ofFilipino blockbuster movies, shows, TV episodes, LIVE news andsports as a TFC member. TRY IT AND DOWNLOAD NOW! If you are not aTFC registered member GET TFC now by logging on to our website(www.tfc.tv) to immediately start enjoying your favorite Pinoyprograms. TFC brings the warmth of Filipino entertainment whereveryou may be. We satisfy your craving for homegrown Pinoy TVshows, relevant news and blockbuster movies. Enjoy high quality,premium content [videos] from the Philippines and ABS-CBN. NEW FEATURES! ▶ Seamless watching of videos on your computer, smart TV, game console, streaming player, phone or tablet. Thismeans you can start watching on your phone while on your way towork and finish the same show on your SmartTV when you get home! ▶Continue watching feature enable you to keep a track of your shows.You may begin watching a show on one device and resume watching onanother right where you left off. ▶ Download, Watch Later allowsyou to watch TV shows and movies anytime, anywhere even when you’reoffline. ▶ Add to My List feature helps you to personalize yourvideo viewing experience by making your own video playlist ofyour favorite shows. ▶ Multi-User Access allows you to share yourexperience as you can extend your account to three other familymembers or friends. USE of TFC.Tv is subject to TFC Terms &Conditions: http://tfc.tv/terms-and-conditions Please email usat [email protected] or chat with our 24/7 live supporthttp://tfc.tv/help Enjoy optimal app usage with Android 4.1 to 6.xphones and tablets. You can now watch your favorite currentABS-CBN programs on TFC.tv HK app from Hong Kong.Don’t miss out on the primetime teleseryes Pangako Sayo, On TheWings of Love and Probinsyano. Catch the latest news on TV Patroland Umagang Kay Ganda. Party-party with the noon time barkada ofIt’s Showtime. Be entertained with world-class performances of ourABS-CBN artists in ASAP 20. Share Kris Aquino’s adventures on KrisTV and more!Download TFC.tv HK app now! This is the abs-cbnnews.com application formobile devices, allowing the Philippines' most trusted newsorganization to bring you the information you need right at yourfingertips. AVAILABLE ANYTIME, ANYWHERE. It's yourcomplete ABS-CBN 360 connection. Built for the demands of today'smedia buyer and media planner. NoInk offers users the best digital reading platform for Philippineonline content. Take experiences to the next level with the best,and most engaging stories, features, and literary works.The NoInkFeed provides the most up-to-date multimedia articles and featuresabout Pop Culture, Fashion & Beauty, Food, Men's Interests,Celebrity Lifestyle, and a lot more. Share the articles on socialmedia sites and engage your friends, family and the onlinecommunity. NoInk also has a Newsstand that offers an extensivearray of books and magazines by Philippine publishers and authors.Get free books and purchase the hottest titles in the country. Getto read books in-app, when you want it, whether online or offline.We have the best-sellers here!Download NoInk and experience whatyou read.—it’s free! See the other side of Daniel Padilla withthisapp! Get to hang out with Daniel and share his love for musicplusother cool antics! You’ll get photos and videos that will haveyoufalling in love with him even more! Feel like a total princess with theKathrynBernardo app! Know how to dress like her and follow herstyles inevery occasion! Get “kikay” tips and advices straightfromher! With ABS-CBNmobile's Free Daily DOS app, youare free to enjoy and be informed and entertained by the storiesand people that matter to you. Sourced straight from yourdestination ABS-CBN sites and social networking accounts of yourfavorite Kapamilya celebrities, all the news, information andstories are organized in a single app - best of all it has nointernet charges so you can enjoy unlimited browsing withoutworrying about your load!Read up on what's latest and trending from:- ABS-CBN.com- ABS-CBNnews.com- iWant TV (iwantv.com.ph)- Push.com.ph- ABS-CBN Sports- Myx- Choose Philippines- DZMM- Instagram and Twitter posts of Kapamilya celebrities andinfluencersThis app is exclusive to ABS-CBNmobile subscribers. Live Philippines Tv channel app let yougetlatest feed from Philippines. Filipino Tv live for you.Downloadthis app now for free and enjoy Live Philippine tv free.ABS-CBN News ChannelCartoon NetworkCgeTVCinema OneCMN RadioDiva UniversalDream CinemaDZMM TeleRadyoFlip TVFox PhilippinesJack TVKapamilya ChannelKidsCoKnowledge ChannelLifestyle NetworkLiving Asia ChannelMakisig NetworkMaxxxMMDA TeleRadyomySkyMyxPinoy Box OfficePinoy ExtremeReal Cebu TelevisionRHTVThe Game ChannelTOP ChannelTV MariaUniversal ChannelUniversiTVVelvetVIVA CinemaBest app to watch Philippines movies,entertainment,newsandmore.Note- We do not provide any type of Live telecast as it is therightof respected owner. Loving Kim Chiu? Then this is the appforyou!Download this app and get fashion tips and personal confessionsfromthe Chinita Princess herself! Plus photos and all the info youneedto be her number one fan! SKY On Demand is an online streaming service with the widestvariety of cable channels you can watch live and on demand. Now youcan catch up on your favorite TV shows not only on your big screenat home but also on your devices. Exclusive to subscribers ofSKYcable, SKYbroadband, and SKYmobi.NOTE: Contents can only beplayed in the Philippines. Mobile Applications Lyrics: has never been easier.Install this freeapp, easy to use and take it wherever you go. This app exists tomeet the needs of you find all About of Enrique Gil Download forfree!Disclaimer:This is an unofficial app. This app and its contentare not officially endorsed or produced by, nor associated with oraffiliated with the music artist(s) or any associated entities ofthe artist(s), such as management or record label. All trademarksand copyrights are property of their respective owners. Thisapplication has ads that comply with Google Play Policy and Pleasesupport the artists and their companies.Mobile Applications lyricshas never been easier.Install this free app, easy to use and takeit wherever you go. This app exists to meet the needs of you findall of Enrique Gil AboutDownload for free!Disclaimer:This is anunofficial app. This app and its content are not officiallyendorsed or produced by, nor associated with, or affiliated withthe music artist (s) or any associated entities of the artist (s),such as management or record label. All trademarks and copyrightsare property of their respective owners. This application is adsthat comply with Google Play Policy and please support the artistsand their companies. Want to know Enchong Dee better? Then thisappis all you need! Enchong‘s app is full of fun surprises!Seeexclusive videos as he tries do things he has never donebefore,video blogs and MORE!